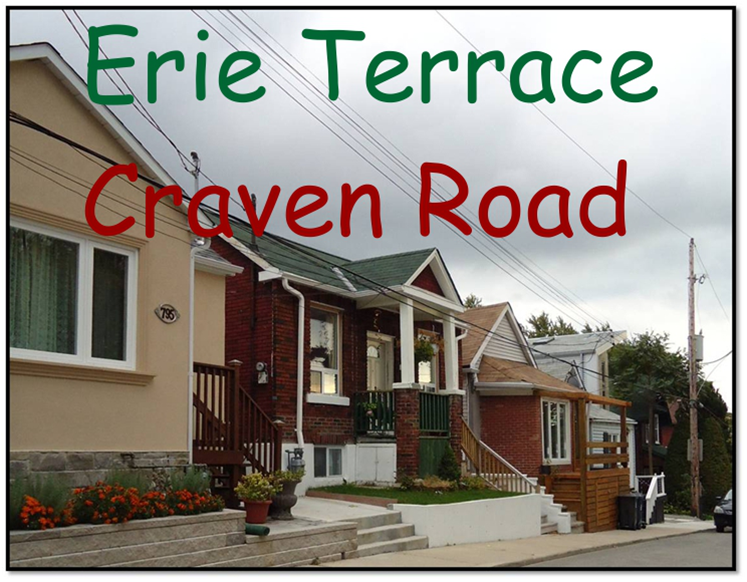 Craven — originally Erie Terrace. 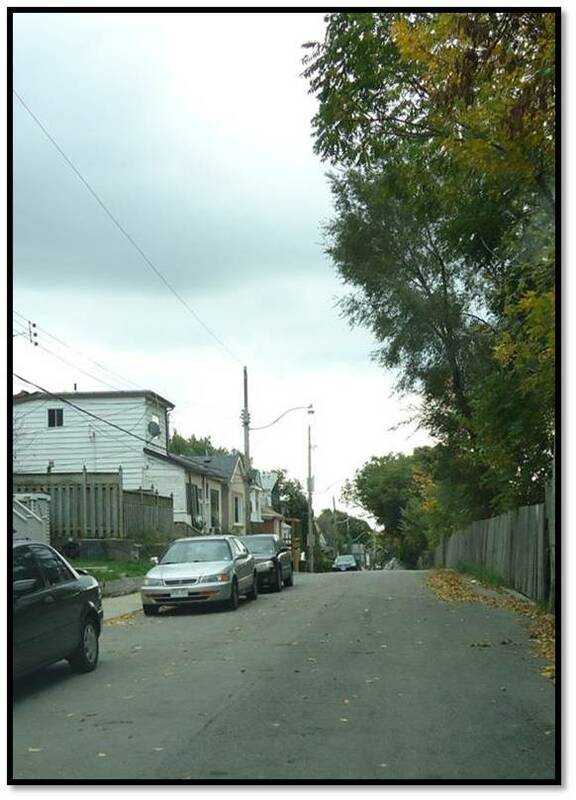 The Ashbridge Estate stretches from Queen Street to Danforth Avenue with Ashbridges Creek flowing through it down to Ashbridge’s Bay. 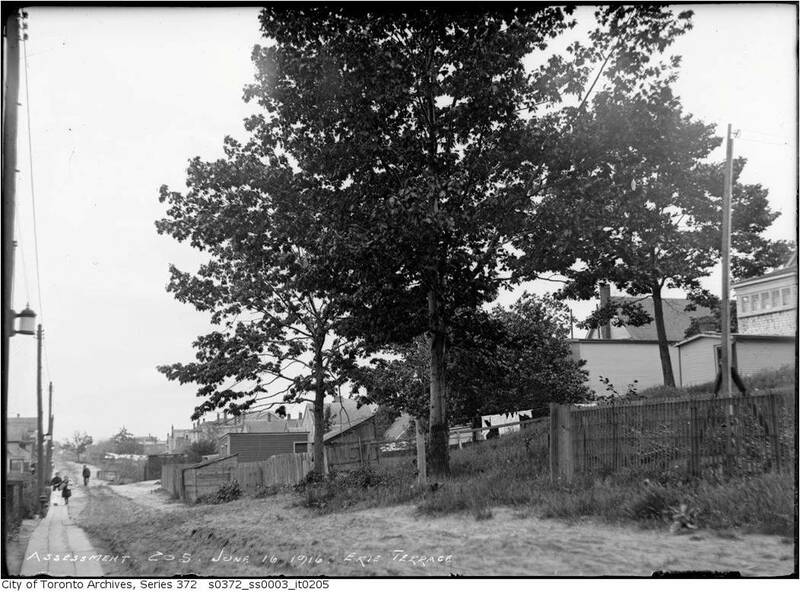 The east side of Greenwood Avenue and the land west of it to Danforth Avenue were incorporated into the City of Toronto in 1884 along with a narrow strip running along the north side of Queen Street to the Beach. The Ashbridges family passed down portions of the original estate to various descendents resulting in narrow strips of farm fields running north south from Queen Street, clearly visible on this map. 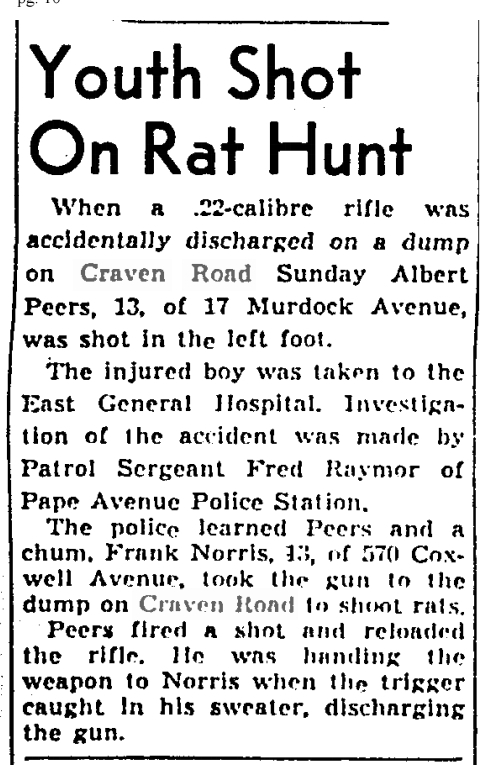 They were east of Morley Avenue (later re-named Woodfield Road) to Coxwell Avenue. The farmers used deeply rutted, narrow farm lanes to drive their farm equipment onto these fields. The farm lanes ran beside the fences at the boundaries of the properties. When the properties were developed, a road network followed the pattern of the farm lanes and fences along the edges of these strips of farm field. Reid Avenue (now Rhodes Avenue), Erie Terrace (now Craven Road), Ashdale Avenue and Hiawatha Road. Redwood Avenue marked the eastern boundary of the 1884 extension of the City of Toronto. 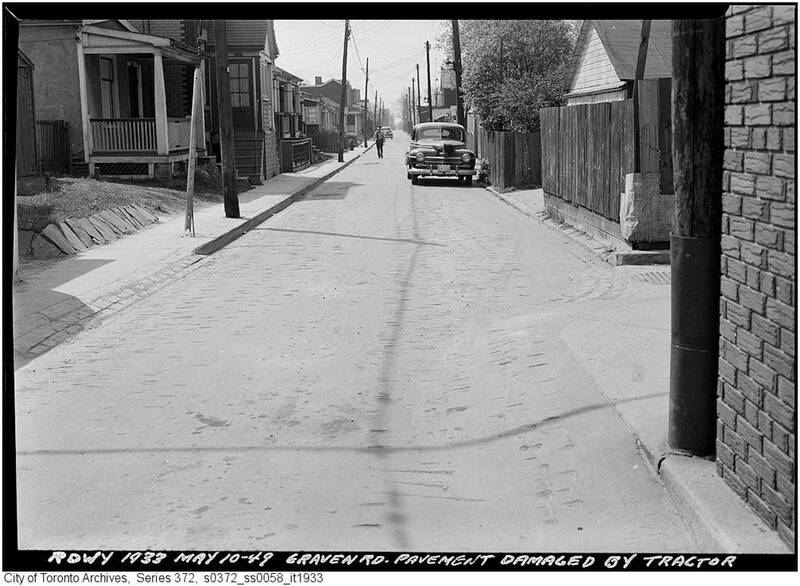 Glencoe Avenue (now Glenside) ran through a brickyard, later used as a garbage dump. It was not filled in and used for housing until after World War II. 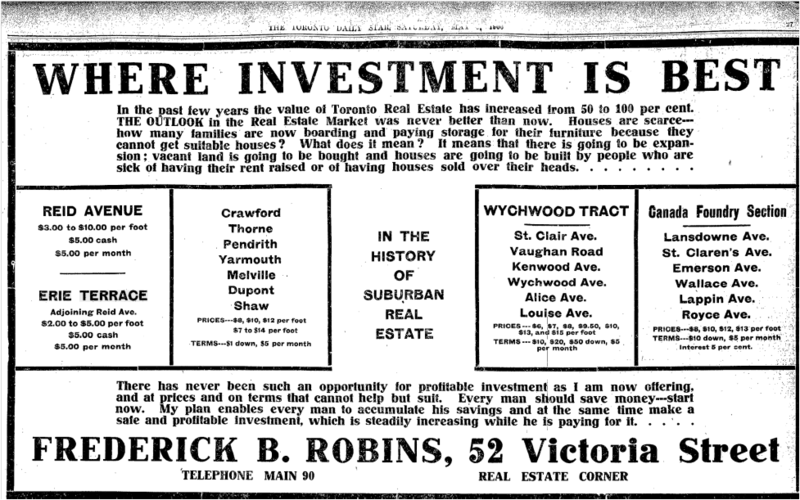 E H Duggan, real estate speculator and promoter, could be called the founding father of Erie Terrace. As this indicates, he was a bit of a “wheeler-dealer”. Goad’s Atlas, 1893. 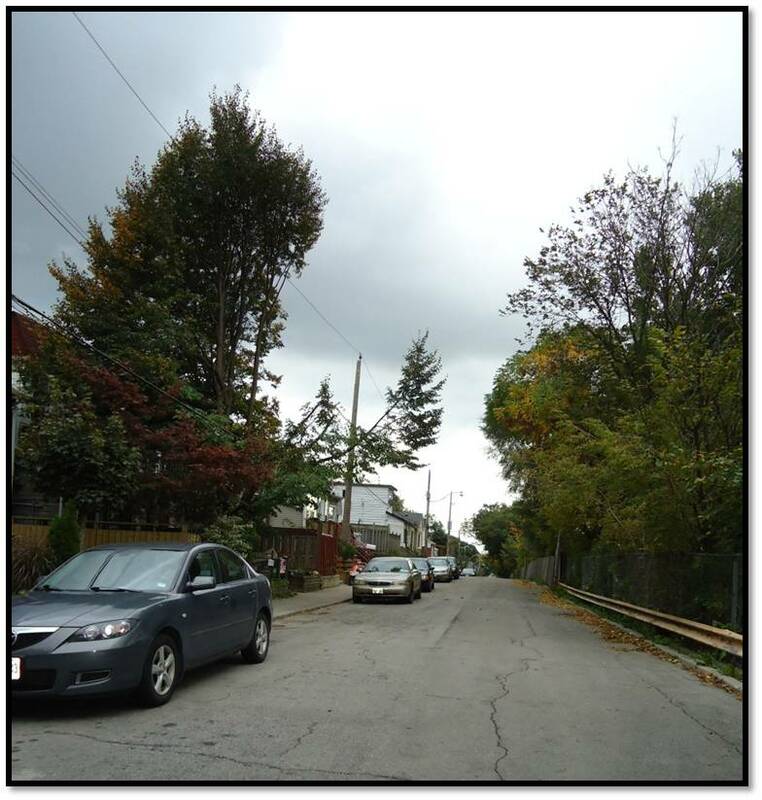 E H. Duggan has laid out Coxwell Avenue and Rhodes Avenue (Reid Avenue), but the lots have not been put on the market yet. 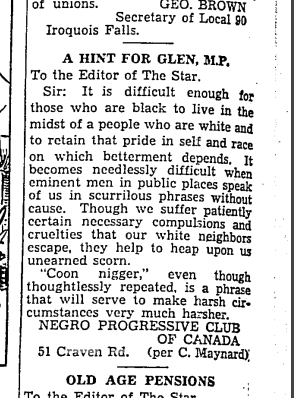 The 1890s was a time of economic depression and he waited for better days and higher real estate prices even for this land outside of the City of Toronto. The pink line is the City boundary. Duggan’s holdings were in the Township of York (East). 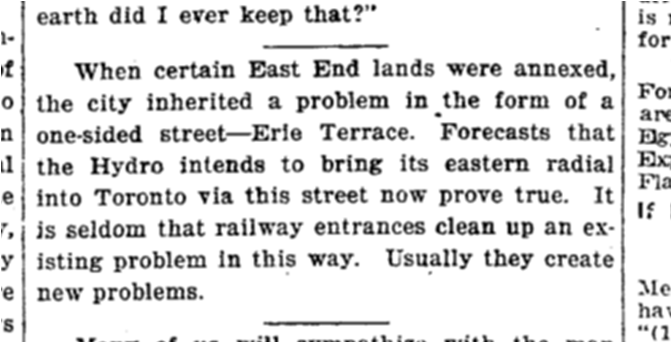 Erie Terrace was developed as a “Shacktown”, outside of Toronto, in 1906, a year before the Ashbridge’s Estate was subdivided for housing. Now Craven Road, it has many tiny owner-built houses. 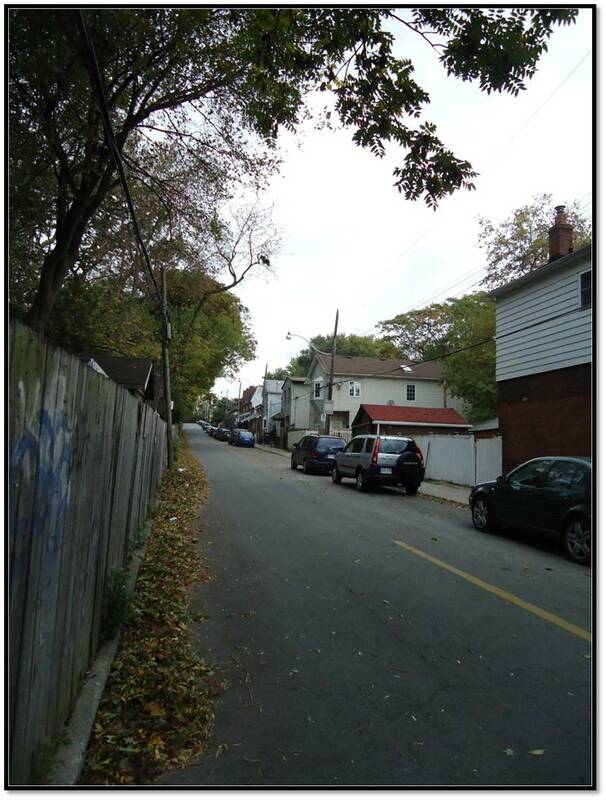 Ashdale Avenue was not subdivided until later. No houses were built until later when its large lots were sold to more affluent buyers. This is why Craven Road only has houses on the east side. Ashdale Avenues bigger homes were built with their backs turned on disreputable Erie Terrace. 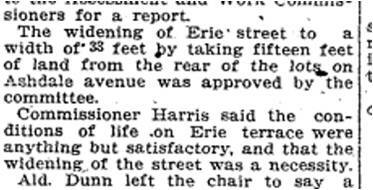 The rowdy poor of Erie Terrace were often accused of trespassing. 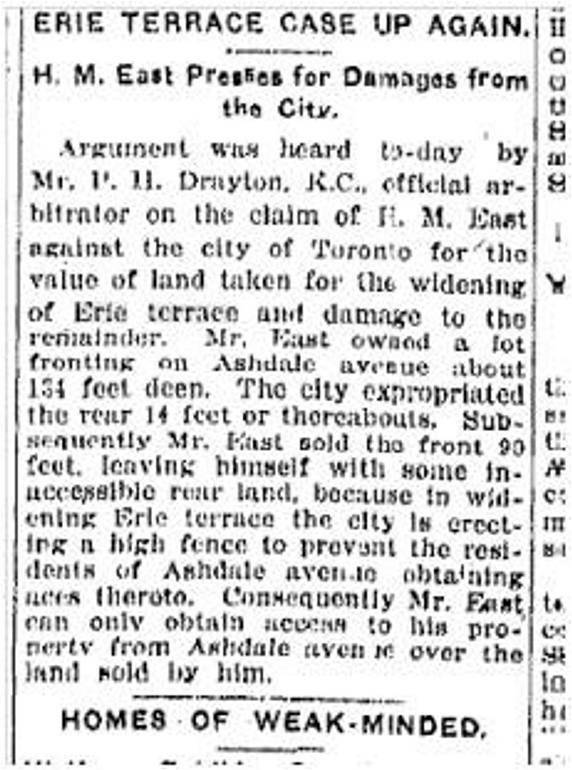 When the City of Toronto widened Erie Terrace in 1916, Ashdale’s home owners had nothing to gain. They lost some of their property and taxes went up to pay for the wider street. A deal was made. 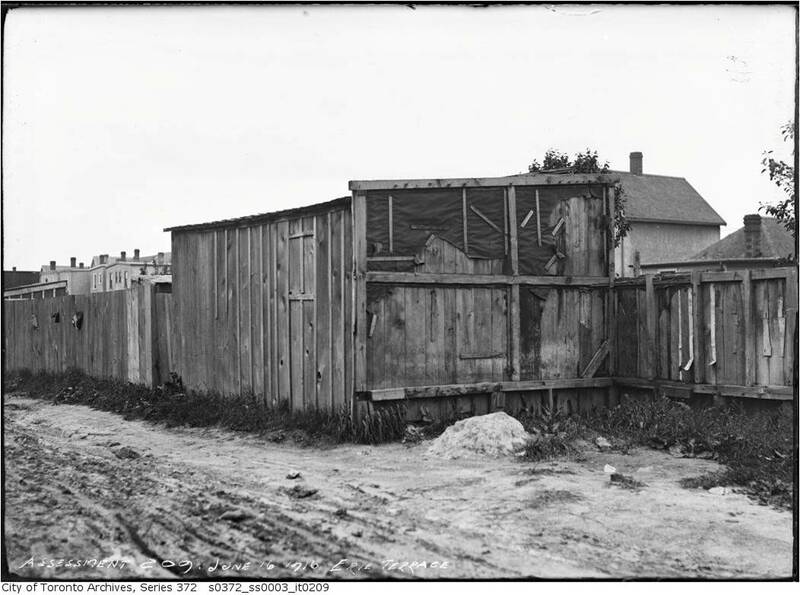 The City of Toronto put up a tall wooden fence was to keep the poor out of Ashdale yards and the . 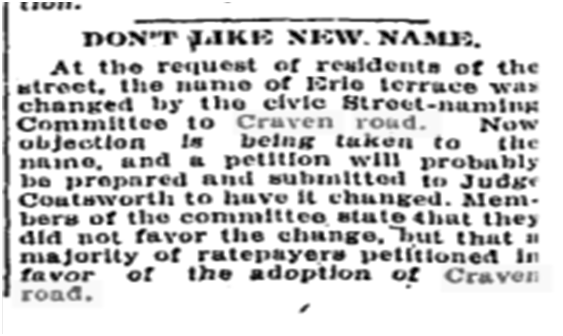 In 1923 the name was changed to “Craven Road” to eliminate some of the stigma attached to living there. 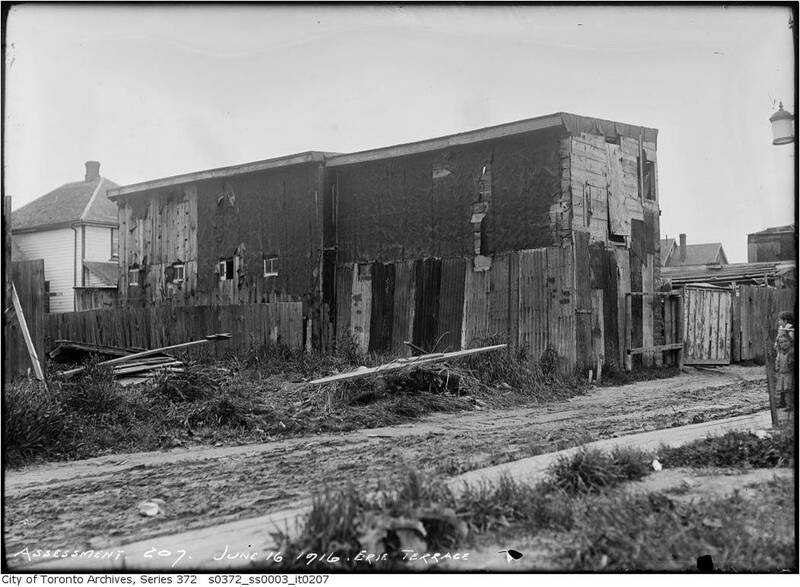 Shacktowns, like that on Erie Terrace, developed just outside the Toronto’s limits where municipal regulations did not reach. In York Township taxes were low and services non-existent. 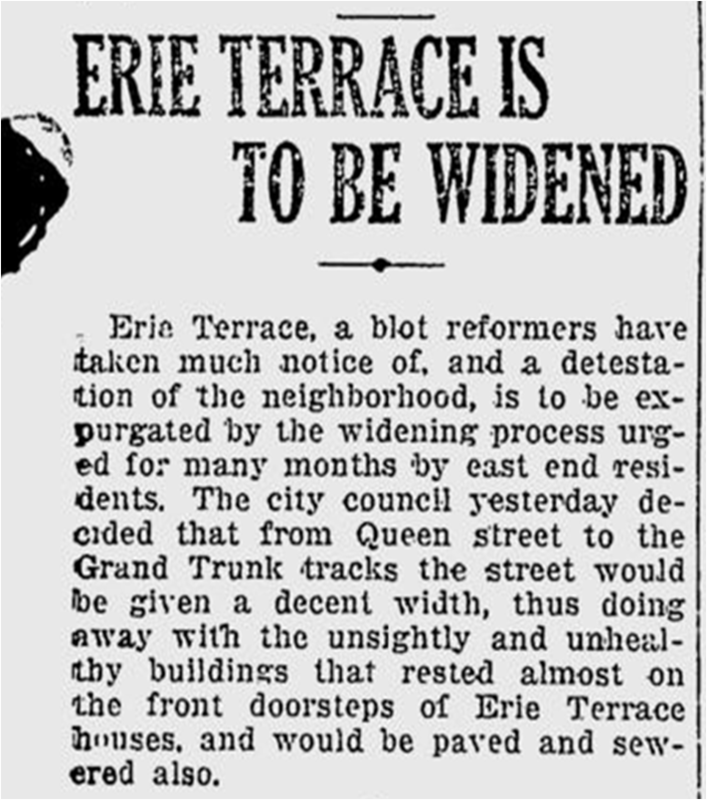 Speculators carved Erie Terrace up into tiny lots that even the very poor could afford. 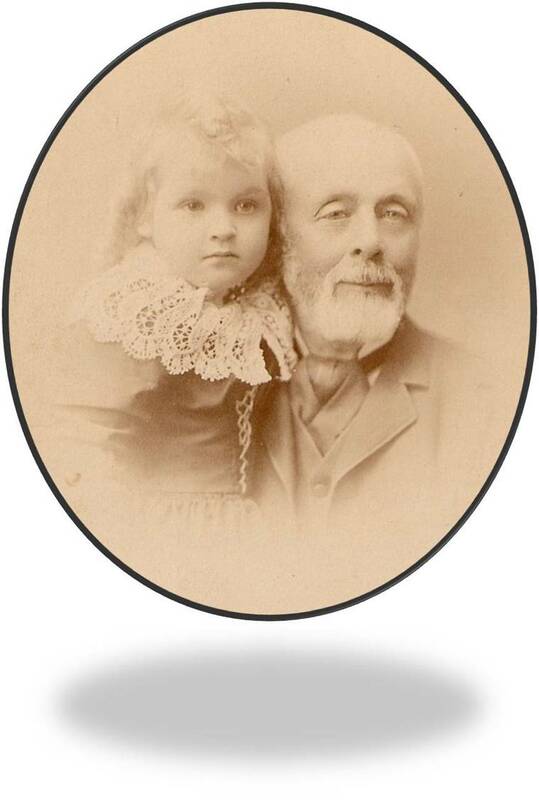 Edmund Henry Duggan owned four lots immediately east of the Ashbridge estate. 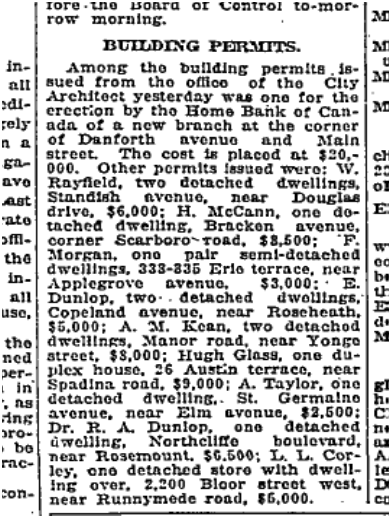 Duggan was involved with the Toronto House Building Association which had developed Parkdale in 1875. 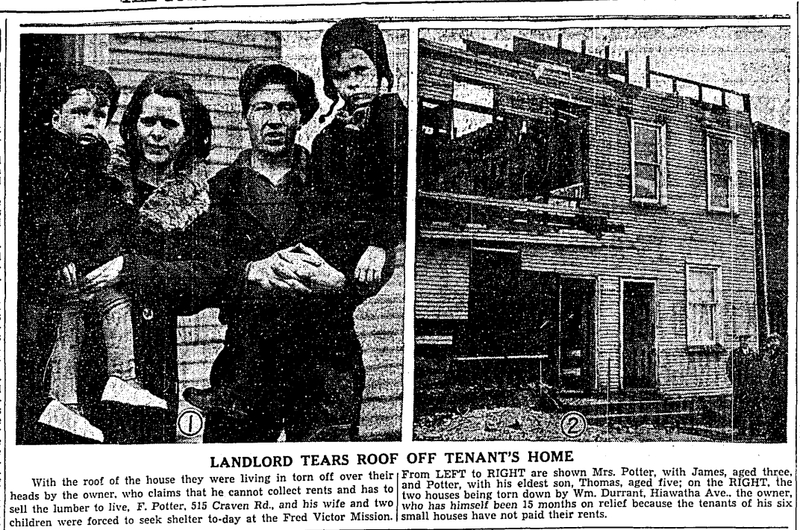 One of the goals of the Association (later called the Land Security Company) was to allow low income families to own their own homes. Duggan’s holdings were laid out in tiny lots. 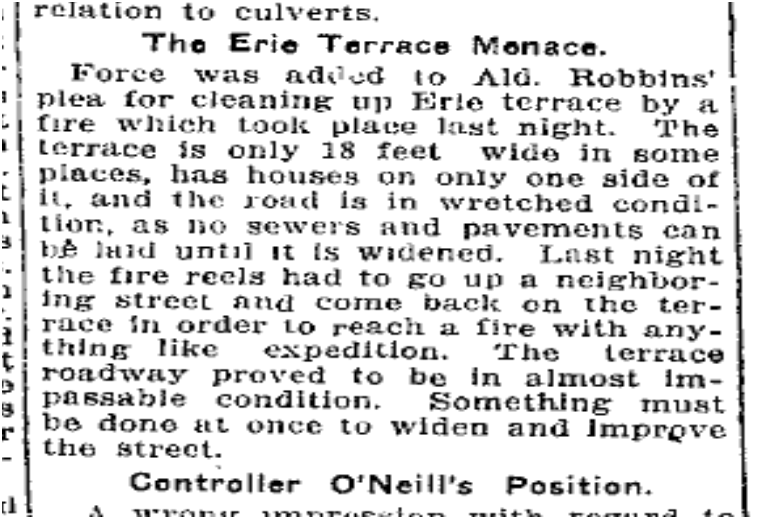 Erie Terrace became a linear slum perched on a sandy gully. The east side of the street was densely inhabited while the west side, owned by the Ashbridges, remained undeveloped until later. 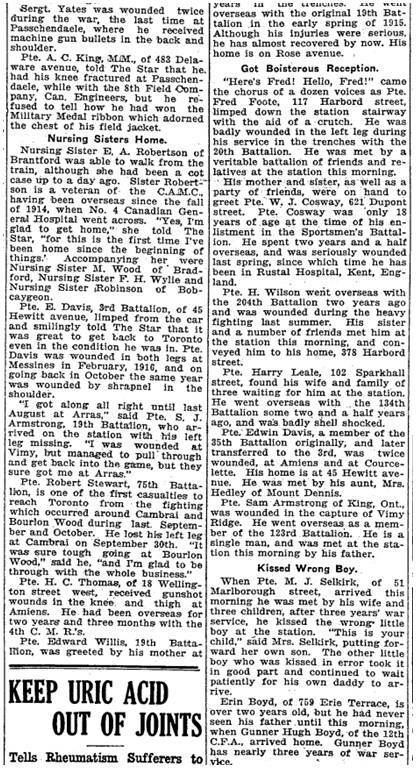 For many on Erie Terrace their first Canadian summers, 1906 and 1907, were the best of their lives, and the first winter was mild. Mostly young couples with children, they quickly got to know their neighbours. They had picnics; formed churches; enjoyed playing sports (especially soccer); and revelled in the woods and fresh air here. They co-operated to build each others houses. Many of the houses in the neighbourhood had been built by the owners themselves when the area was outside the City limits. 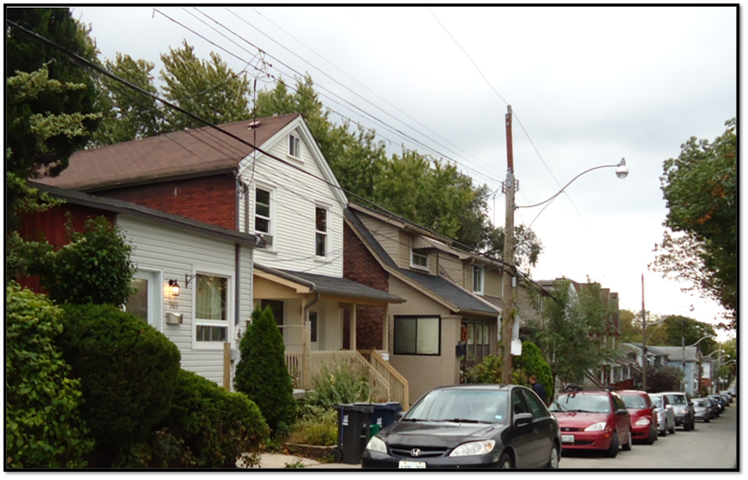 By the time of amalgamation, the area was well on its way to becoming a working class, low income street car suburb of Toronto. 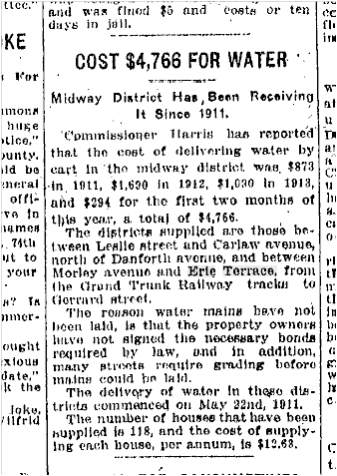 Some streets, particularly Erie Terrace, later called Craven Road, were densely packed with small houses, some mere huts, without running water or sewage, with contaminated wells and over-flowing outhouses, creating a public health nightmare. 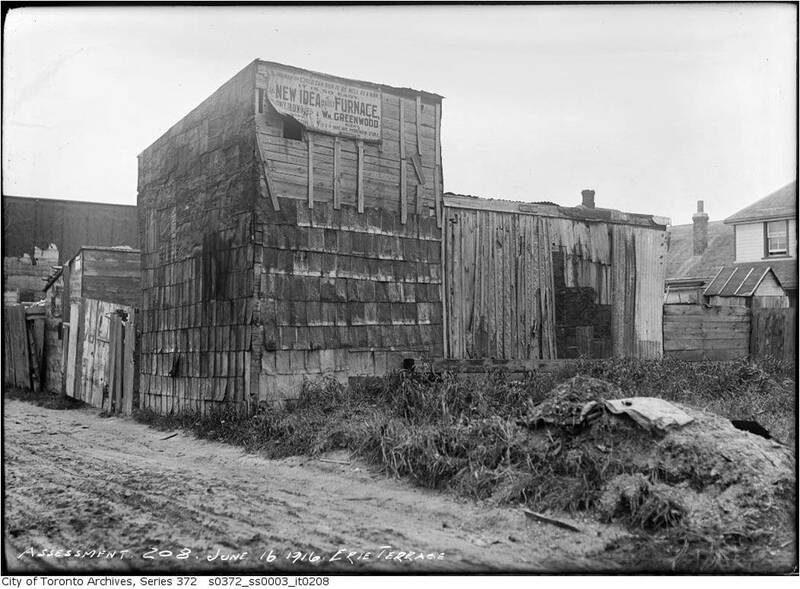 Some, including Toronto’s Medical Officer of Health Charles Hastings, saw these Shacktowns as epidemics waiting to happen. But, in October 1907, a financial crisis smacked Shacktown down. Stock market players tried to corner the market on a copper company’s stock. When nervous people drew out all their savings, banks collapsed. The economy nose dived. Through no fault of their own, the Shackers were unemployed and broke. Unfamiliar with our weather, they began to freeze in unheated shacks as a fierce Canadian winter began. In January, 1908, the Globe received a tip that people were starving. Their reporter was appalled by what he found: The sound of little children crying was yet in the wind that whimpers and blow over the land of tar-paper homes. The weak spot in the situation is the east end shack district over the Don. A large part of it is within the limits and should be covered by the city organizations, but some part of it, several hundred houses in all, is in the township, and distress is said to be widespread there. I came across a case recently of a man and his wife who had scarcely any food and no money. The man was out of work, and the wife’s efforts to get work were of no avail. They were hard pressed, but were not so poor that they could not help those worse off than themselves. They took in two friends, a married couple from the city, who had been turned out by their landlord for failure to pay the rent, and together the household had been putting up a brave fight. It was a case of the poor helping the poor. “We had more Scotch than any other nationality and they are known as a very thrifty people. We could tell you some awful tales about the English.” “What about the Irish?” asked Mr. Fred Dane, of the Irish Protestant Benevolent Society. “They are running the others very close,” replied Mrs. Grant. By mid February 1908, the Relief Fund was meeting Shacktown’s basic needs. Spring would, bring not only flowers but work. The economy recovered as investors intervened to stabilize the stock market and banks. 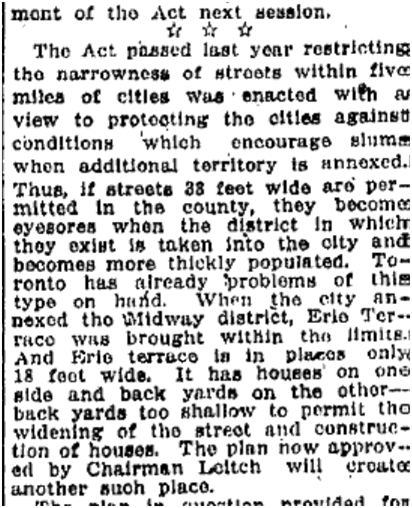 While jobs were one solution to the Shackers’ problems; annexation was another. 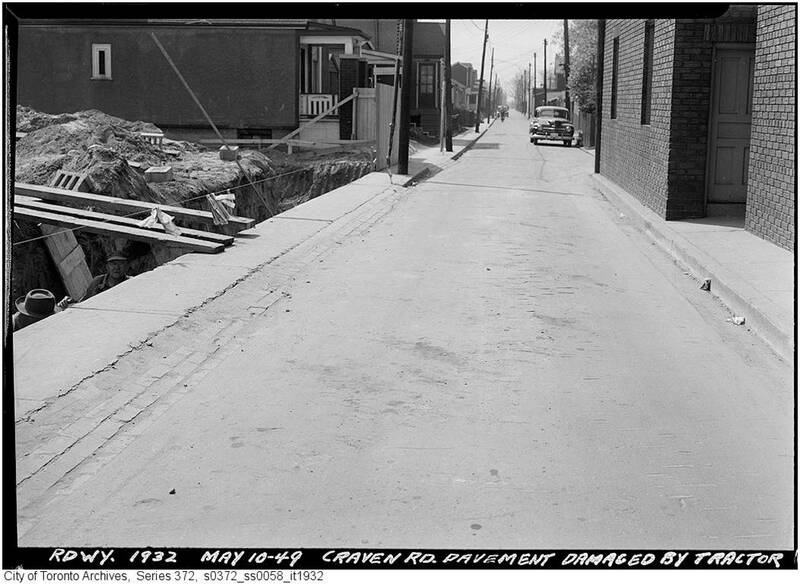 Shacktown would get water, sewers, fire, police and paved streets if they joined Toronto. They voted to join the City. 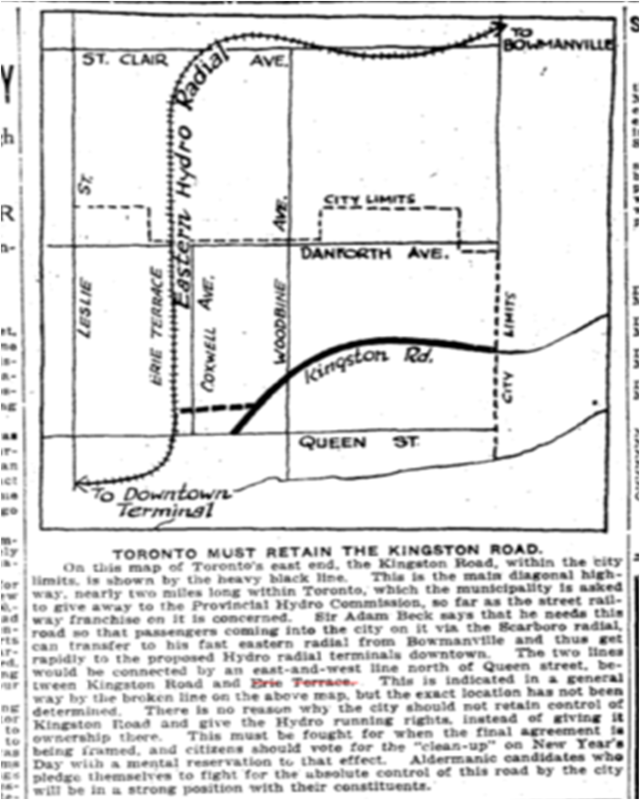 In 1909 the area became part of Toronto. 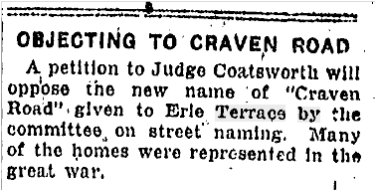 As the East End became urbanized, all too often Erie Terrace (Craven Road) was in the spotlight. Police caught Gladys Durant, a cross-dressing 15-year old girl, of 523 Erie Terrace trying to ride the rails to Texas. She was with two boys, Phillip Clare, aged 20, of 417 Erie Terrace and Chris James. A county constable arrested the trio in the rail yard in the west end. They were charged with vagrancy. Petty crime, like this with its hints of sexual misdeeds, occupied most of the journalistic attention at the time. 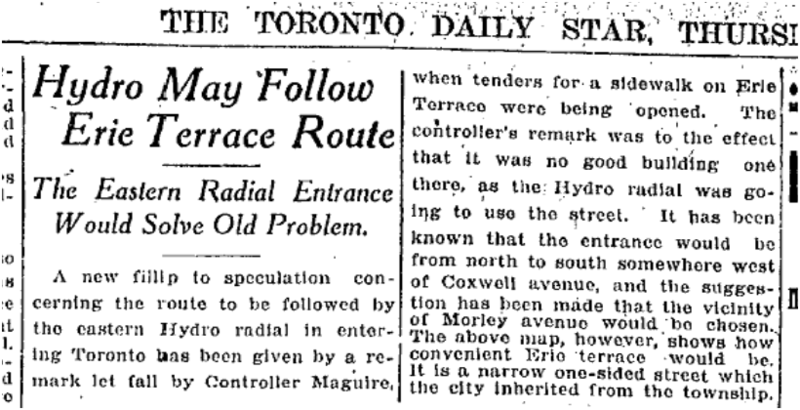 When Midway was annexed in 1909, Erie Terrace came into the City of Toronto. This narrow street, with houses on only the east side, stretched from Queen Street past the railway tracks. Unscrupulous developers cut this strip of land into tiny lots on which poor people built tar paper shacks and tiny houses, densely packed together, with no outhouses and no running water. This virtually guaranteed the contamination of their wells, the nearby creek and the ground water. 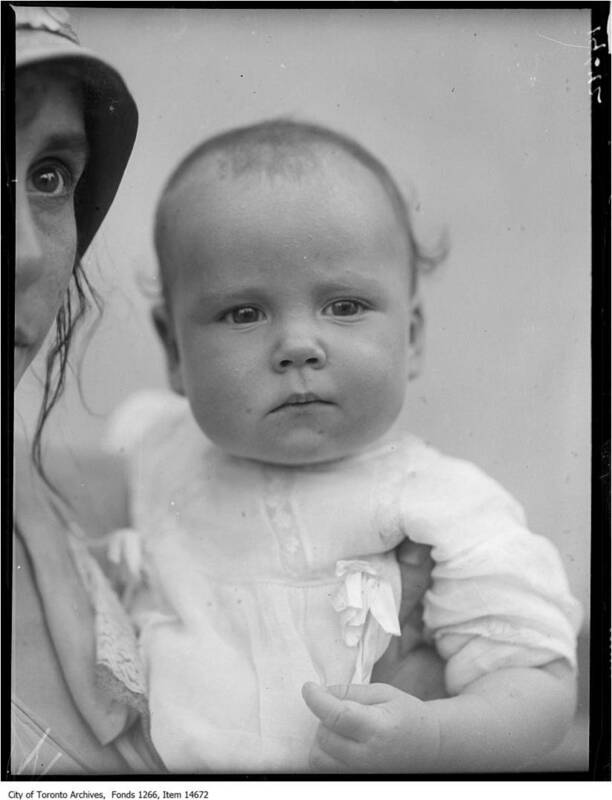 Medical Officer of Health, Dr. Charles Hastings hated typhoid fever: it killed his little daughter. 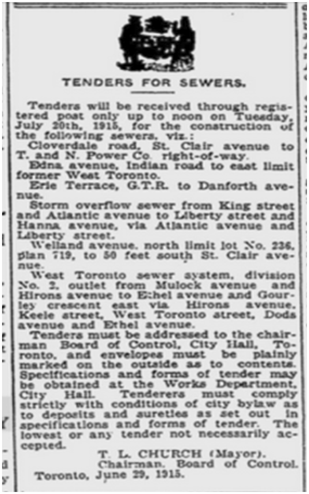 Pushed by Hastings, the City of Toronto passed a By-law requiring all houses in the newly annexed areas to have a flush toilet, a wash basin, a connection to City sewers and piped-in City water. Erie Terrace residents protested against being charged for sewage connections. They had no choice but to comply or leave. The Public Health Department closed their homes as unfit for human habitation if they failed to puts in “the modern conveniences”. Some protested, but other residents supported the City of Toronto. The immigrants brought with them great dreams and great expectations, but, initially at least, their hopes were thwarted by the lack of amenities and services. These were services that these British urbanites took for granted. Their absence came as quite a shock. They demanded change as they met with their elected representatives in meeting after meeting. The records of one meeting in particular make clear their frustration. 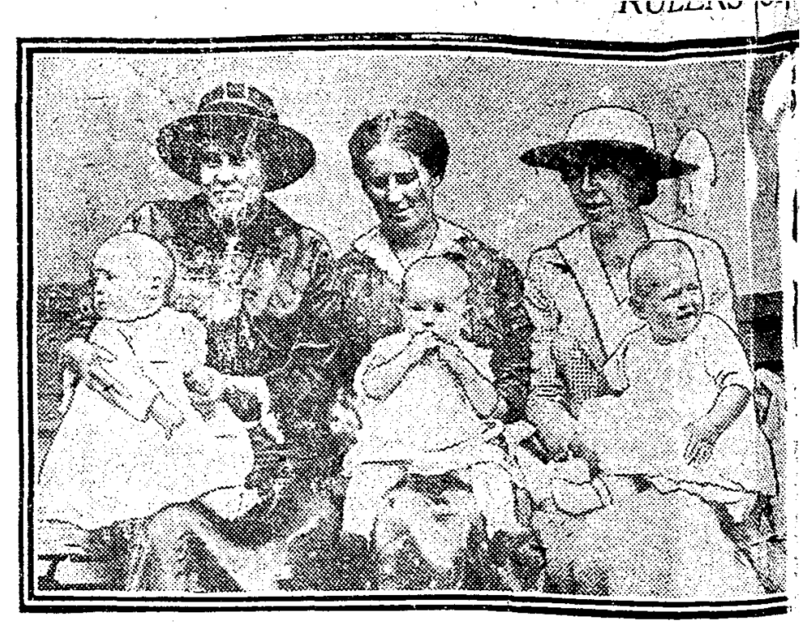 On December 2, 1911, the members of the Midway Ratepayers’ Association met with their aldermen in the Orange Hall on Rhodes Avenue. It was a stormy, roily meeting of the members of the Midway Ratepayers’ Association who gathered last night in Rhodes Avenue Hall to batter with a load of complaints everyone aldermanic who had the courage to show himself within the doors, and at the same time it was a house divided against itself, between loyalty to and abuse of the reigning aldermen.” …”Half of those who live in that district’ he [local resident Mr. Gillespie] stated, “were too lazy to get out and work on a petition. They want water they want sewers, they want everything all at once, and they won’t work for it. 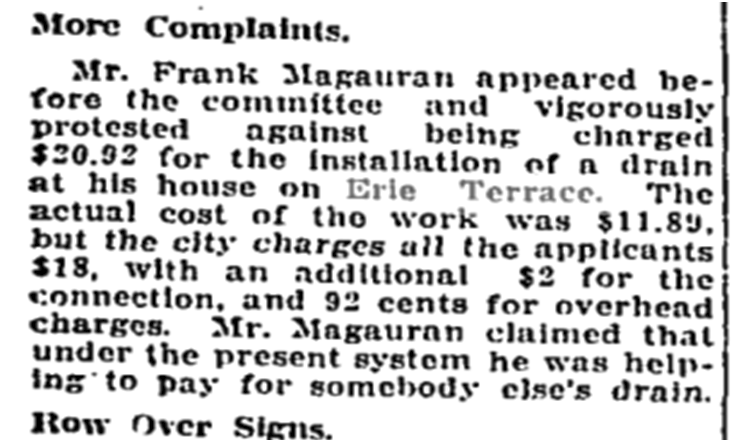 I know of men on Erie Terrace who refused to pay the extra 37 ½ up to 75 cents taxes which would have entitled them to vote in the city, and yet they’re the ones who are doing the hollering because the aldermen don’t get them everything in a minute. The residents wanted sewers, clean water piped in from the municipal waterworks, sidewalks, roads – in short, they wanted everything residents in older, downtown neighbourhoods had. 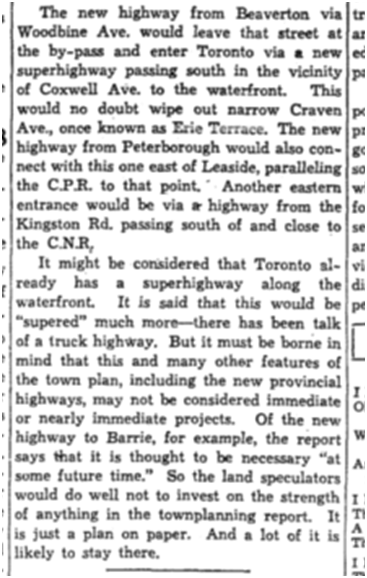 They wanted a subway built under the Grand Trunk Railway to improved road access from the neighbourhood to Danforth Avenue and Queen Street East. They wanted a walkway build under the railway track so that children could get safely from the streets north of the rail line to Roden School. City politicians were not about to put up with ingratitude from Shacktown. In essence the politicians told the disgruntled ratepayers that they should be happy that the City of Toronto took the neighbourhood in at all given the bad shape it was end. Being told that they should be grateful for their lot and not complain did not go over well. The Works Department has a number of vexatious street problems on hand, and the committee made personal investigation into some of these yesterday. One is on Erie Terrace in the Midway. 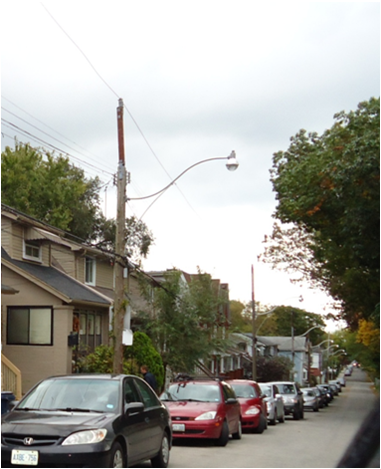 It runs north from Queen street to Danforth avenue and the width varies from 15 to 22 feet. There are small frame houses along one side and on the other are the backyards of houses which front on an adjoining street. 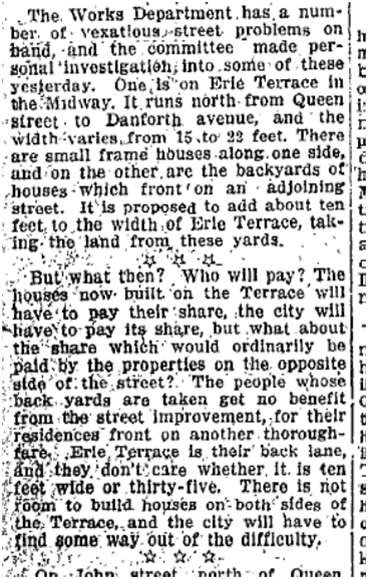 It is proposed to add about ten feet to the width of Erie Terrace, taking the land from these yards. Not everyone could afford to pay for the new improvements. But if they did not install a toilet, sink and bathtub, all connected the sewers, the Health Department would have them evicted and the Health Department did this — for the greater good. 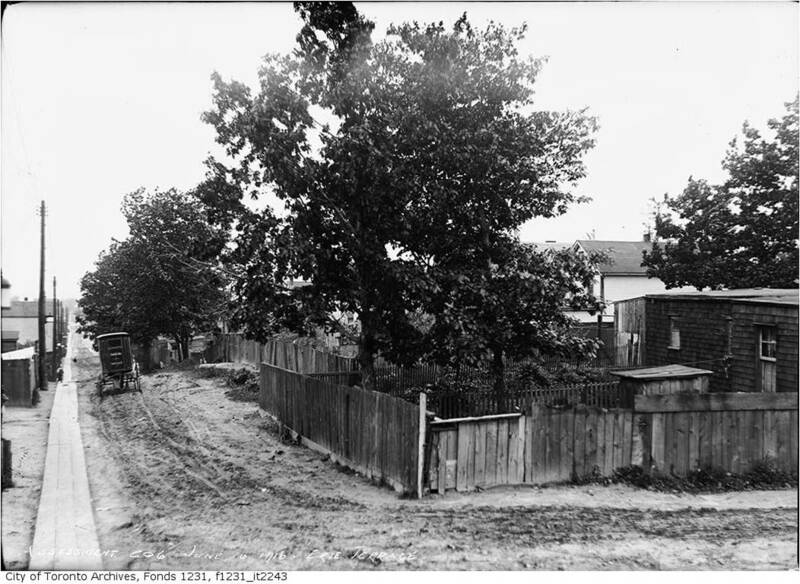 When the City of Toronto widened Erie Terrace (Craven Road) in 1916, the municipality put up the fence. 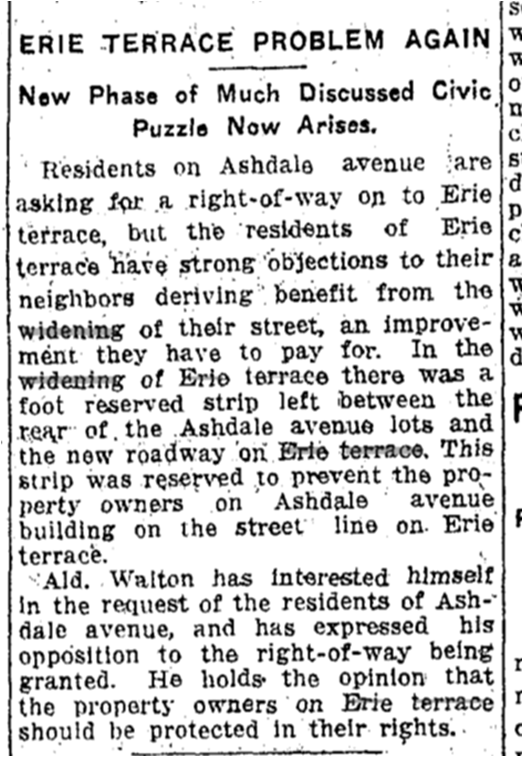 The people on Erie Terrace did not want the Ashdale Avenue people to use the widened road because the Erie Terrace people had paid for it and the Ashdale Avenue people had not. Back then if the City fixed your street up, paved it or put sidewalks in, the people living on the street were expected to pay for it. The charge was added to the property tax bill. 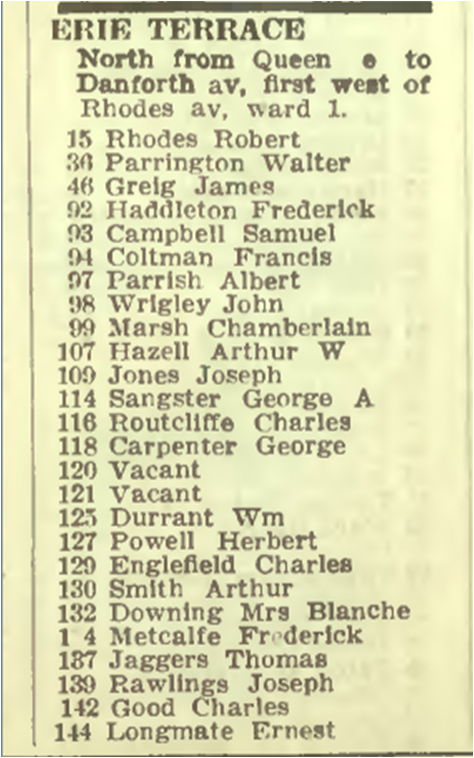 The people on Ashdale were only slightly more affluent than those on Erie Terrace, but Erie Terrace had a reputation much like Regent Park had until recently: crime, prostitutes, drinking, etc. So the people on Ashdale wanted the Erie Terrace people out of their back yards. The City, meanwhile, did not want the Ashdale Avenue people using their now much smaller backyards for garages and sheds. 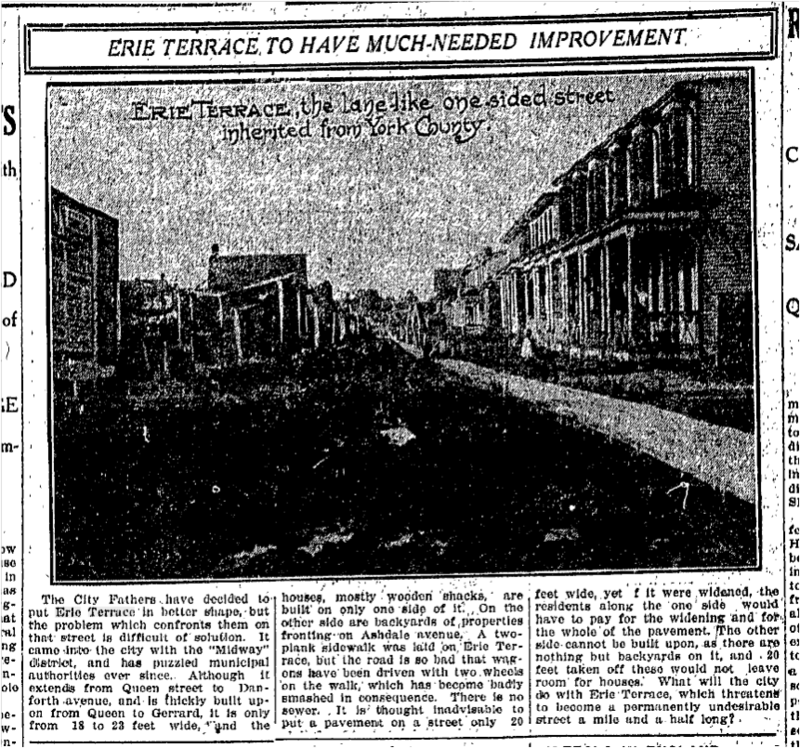 The City had expropriated part of the Ashdale Avenue backyards to widen Erie Terrace. 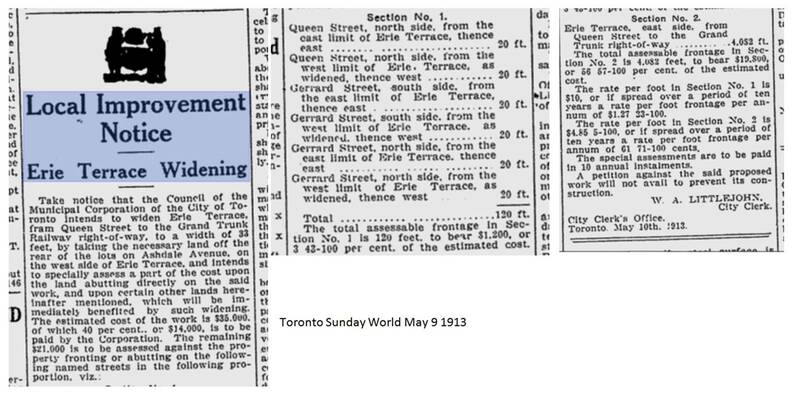 But what was left of those backyards didn’t have enough of a setback under Toronto Bylaws for building anything. 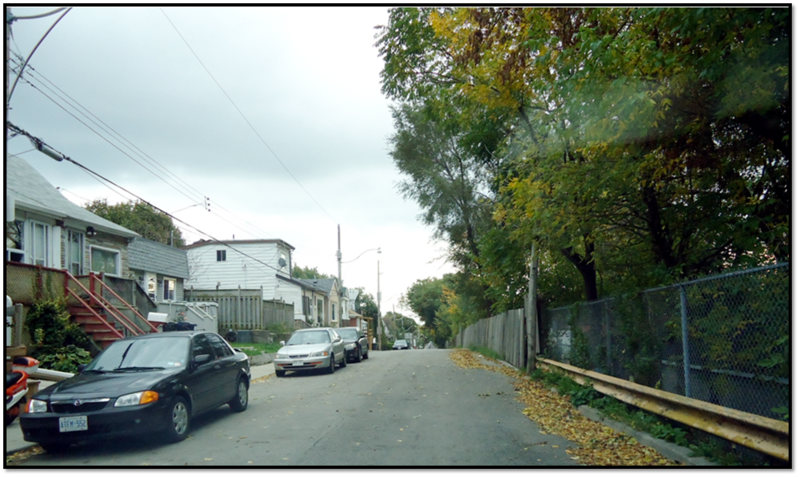 So the fence is maintained by the City of Toronto despite periodic attempts to have it removed or partially dismantled. 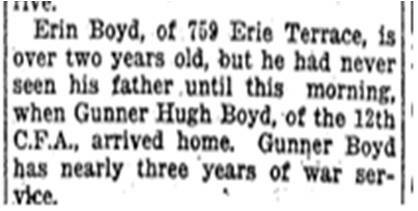 I first started investigating Craven Road in 2002 when someone I knew from an America On Line birding board asked me if I could find out where Erie Terrace was, how his great grandfather died and why his great grandmother had to put the four boys in an orphanage and lose them. 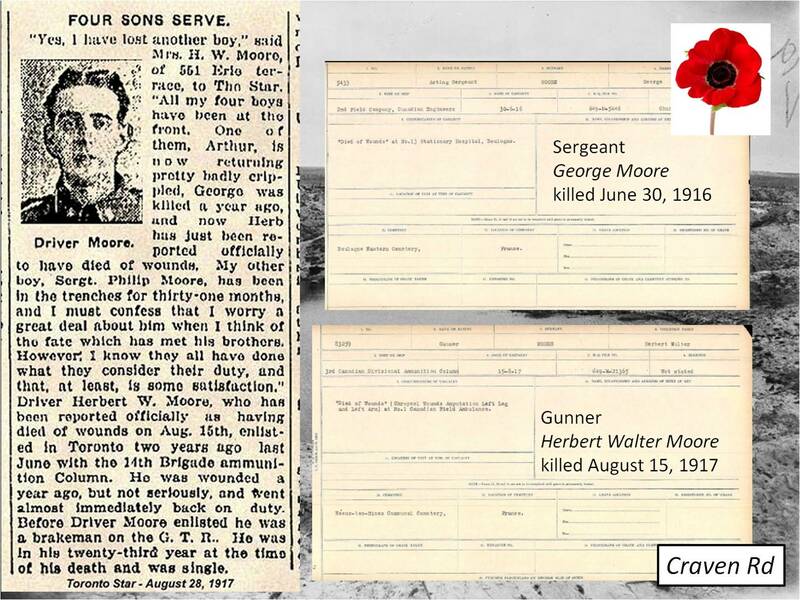 The solider who died was George Threlfall. 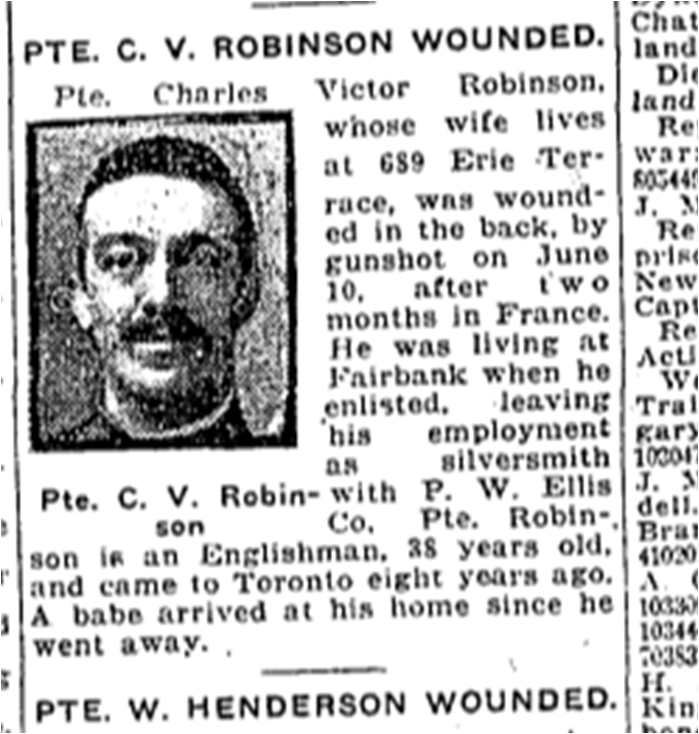 He most likely died of influenza, in a precursor of the 1918-19 Spanish flu epidemic. 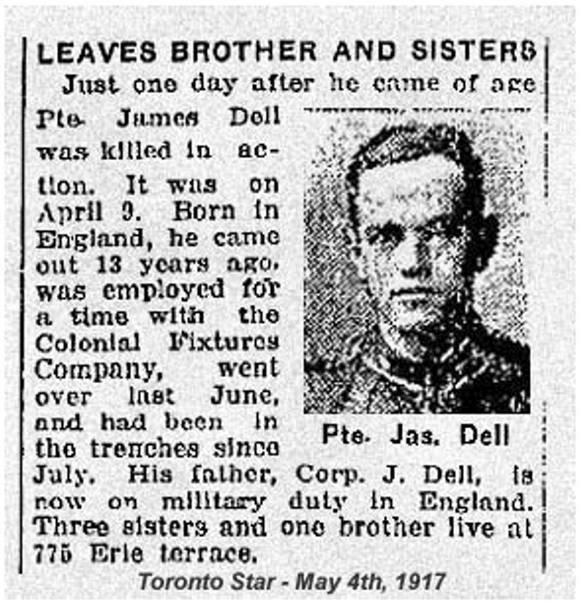 THRELFALL, Corporal, GEORGE, 6897, Royal Canadian Regiment. 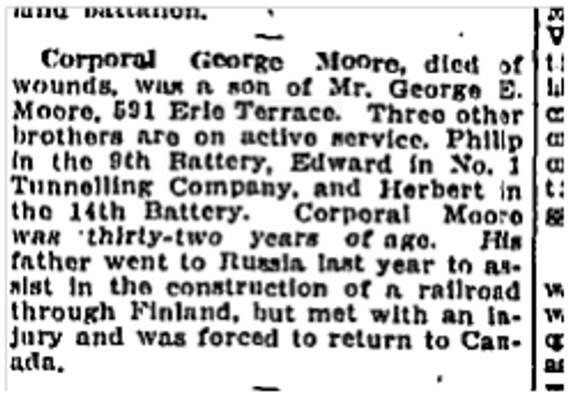 Died of sickness 1 December 1916. 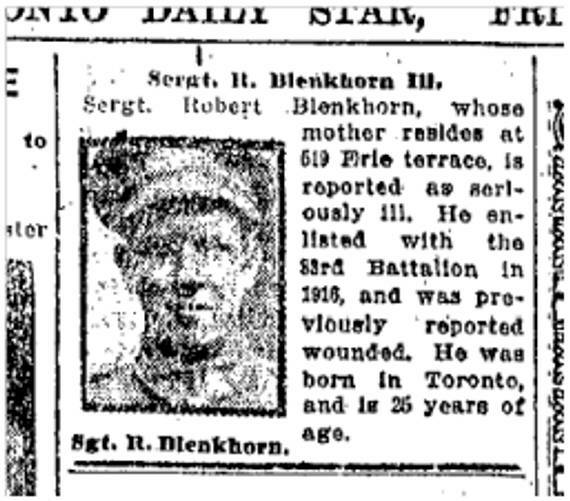 Husband of Emma E. Threlfall, of 283 Erie Terrace, Toronto, Ont. Grave Ref. S. F. G. 32. 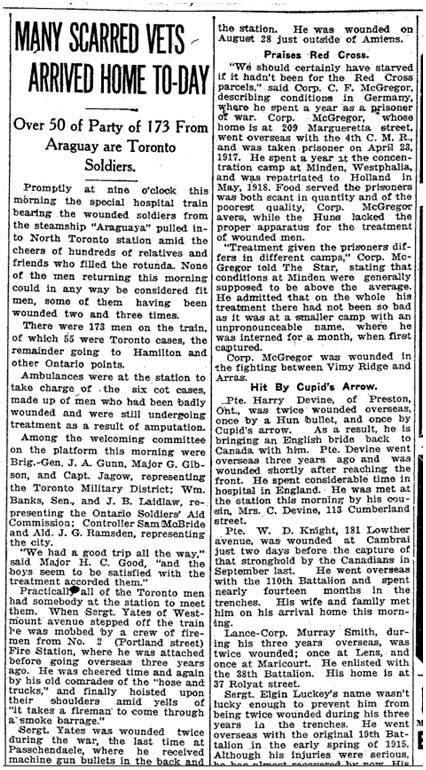 The City of Toronto was now able to wring the money it wanted out of Erie Terrace and others in the East End now that virtually all of the men were working…most in the trenches. 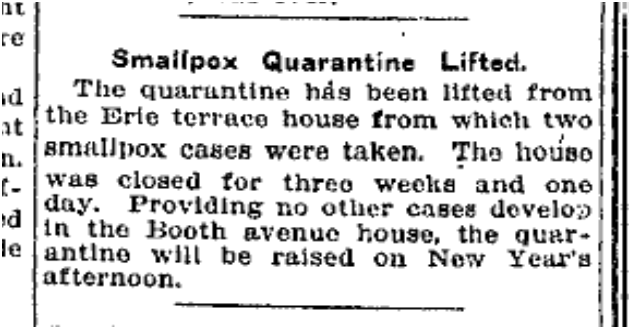 While the War ground on, the Spanish flu hit, seemingly out of nowhere, spread from military base to military base and brought home by the returning soldiers. Older people seemed to have some resistance to it, but the young did not. Over 300 New “Flu” Cases are Reported at the City Hall. 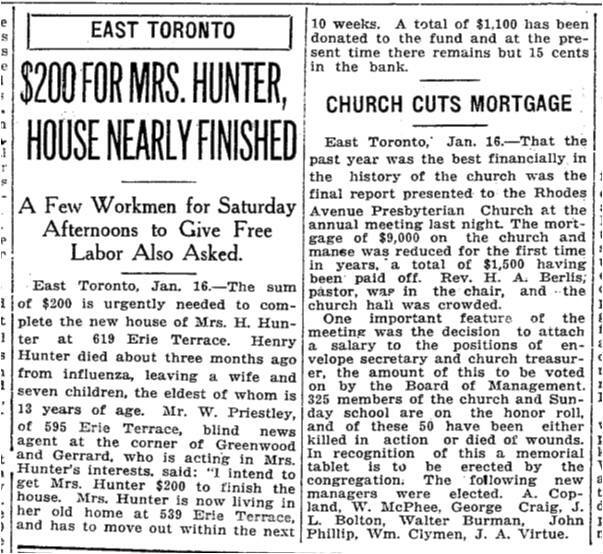 Dr. Hastings issued strict orders to-day that under no condition must conventions of any kind be held in Toronto until the present epidemic of influenza had died out. 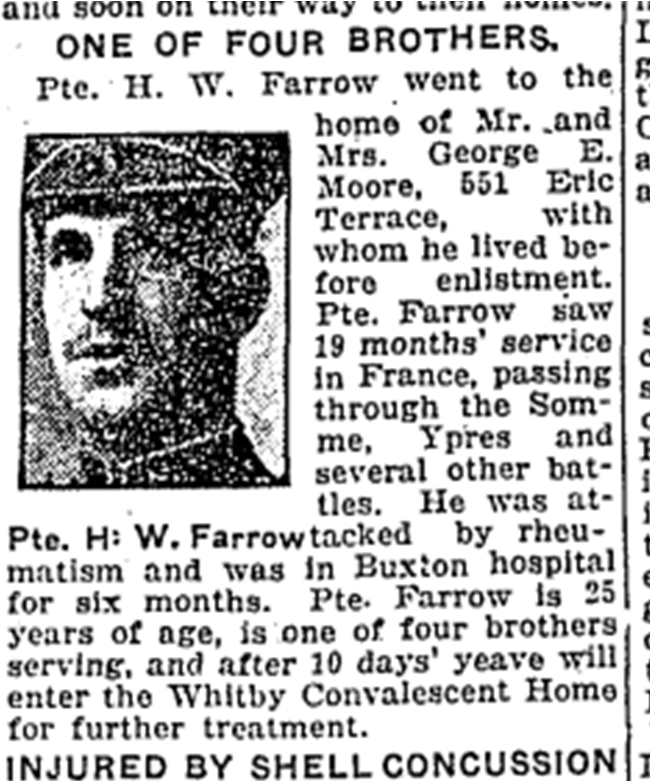 The First World War cut deep into the heart of Erie Terrace. 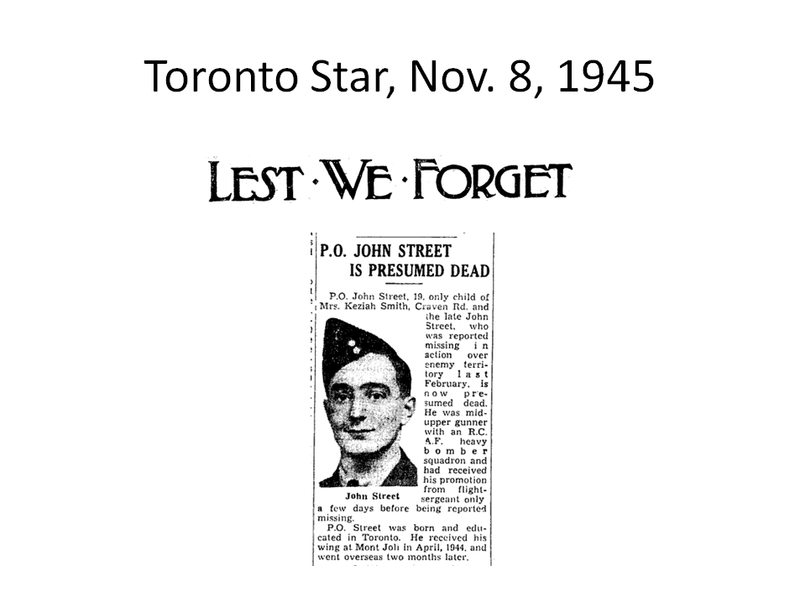 World War I cost Toronto 10,000 lives. 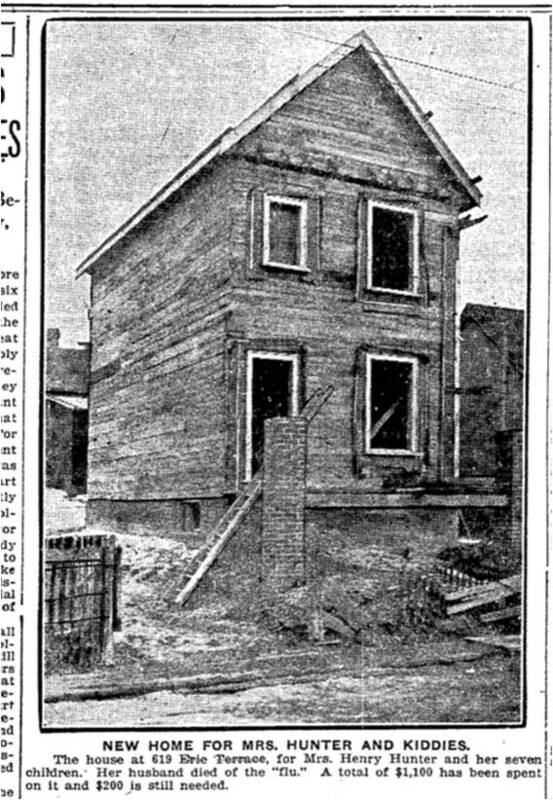 This odd, long street of tiny houses on only the east side contributed a disproportionate number of men to enlistment. 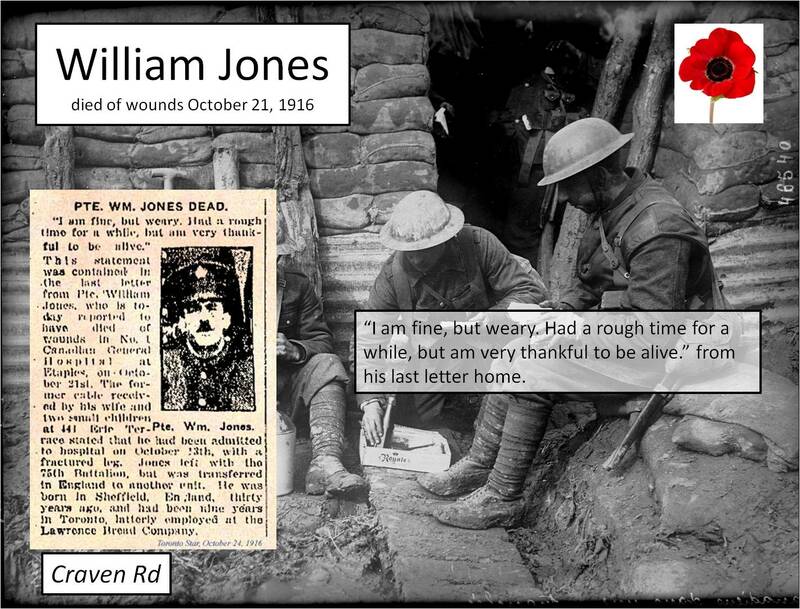 Most were in the infantry and in the trenches of Belgium and France. 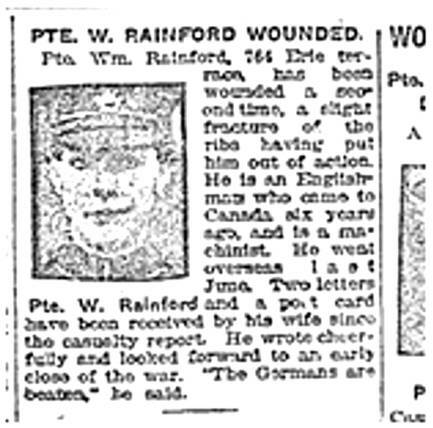 Many did not come home or came home so wounded that they could not work. 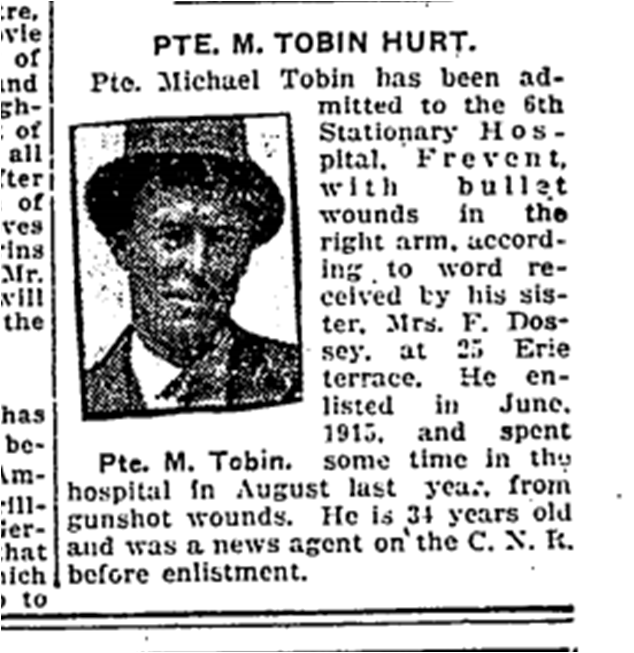 At the end of the Great War, Erie Terrace stood emptied of many of its men, a street of widows without adequate pensions or a way to make a living. Some had to give up their children, sending them to orphanages. Many women went into domestic service downtown or sought other jobs elsewhere and left. Some remarried. Some stayed. The emptied houses quickly filled with returning veterans desperate for homes in a post-war housing crisis. 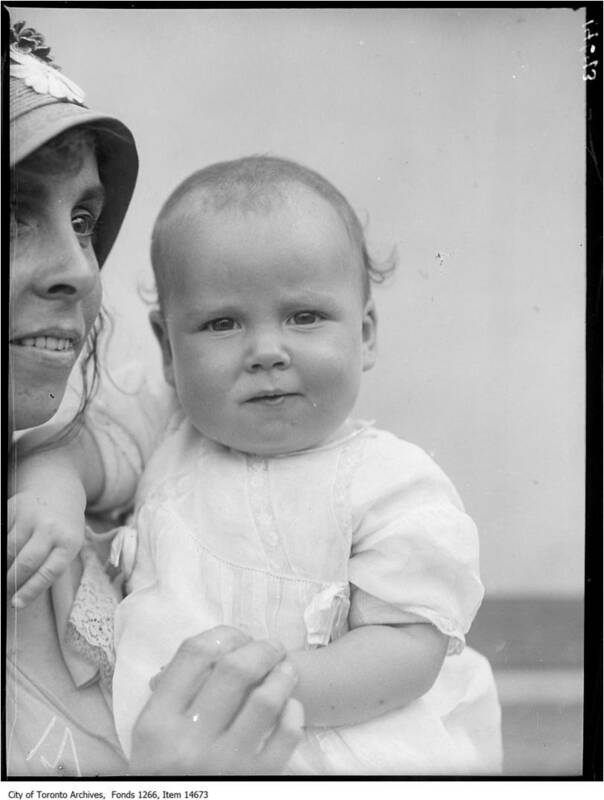 Men and women turned to rebuilding their lives, having babies, raising their children and entering them in baby contests. Mailers Int. Union. Local 5. meets first Sunday, Labor Temple, Robt. Gardiner, 11 Cherrynook Gdns. Waiters and Cooks Local No. 300, meets second and third Thursdays 10.30 a.m., Club Boom, 301 Dineen Bldg., H. W. Brooker, secretary, 88 Prust ave.
Beloved local teacher, Cranswick Craven, and his granddaughter. 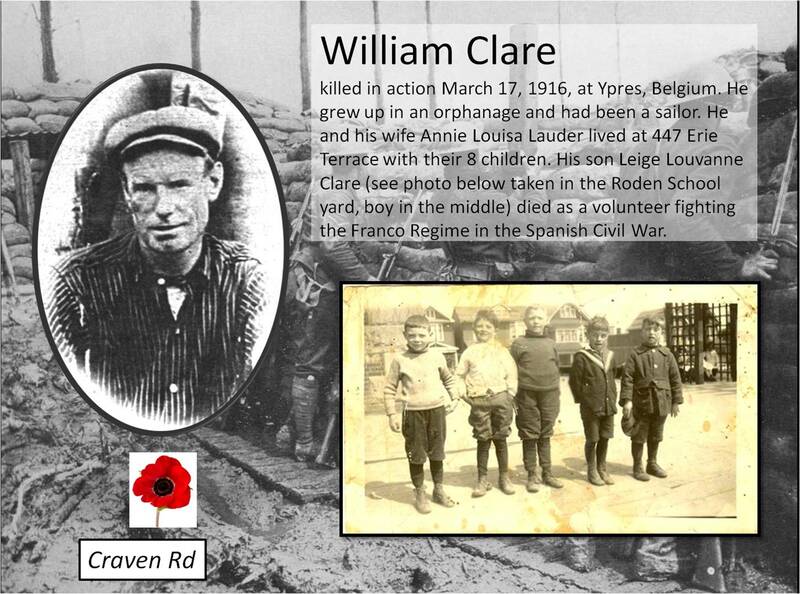 Although more research is needed, it is very likely that Craven Road was named after this man who taught in nearby Norway School. Photo from a Private Collection. 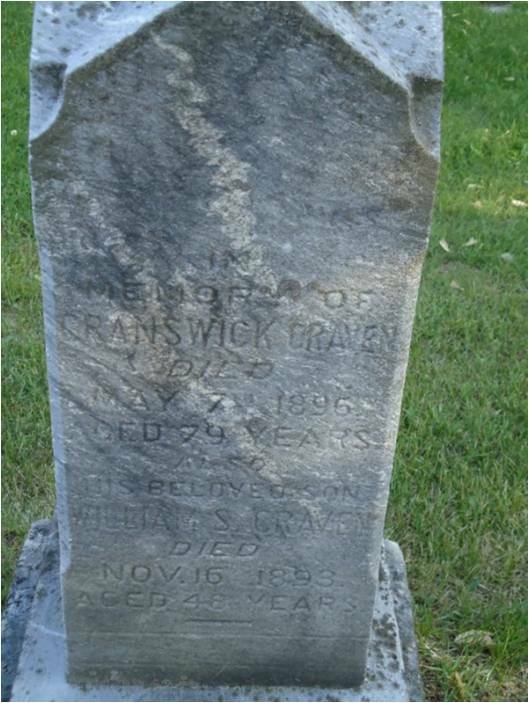 Cranswick Craven’s grave. Photo by Joanne Doucette. Everyone in the neighbourhood wasn’t as saintly as Principal Craven. Petty theft and break-ins were perpetual in the East End. The poor usually stole from the poor. Often people stole clothing such as shoes or even underwear from the clothesline. Yet most people were hard working, when they could work, shared the little they had, and obeyed the law even when the law was unjust or indifferent to their situations. During the Great Depression of the 1930s, the City’s unemployment rate was over 30 percent. On Craven Road, most of the breadwinners were out of work and out of luck. But Craven Road survived which is astonishing considering the number of attempts to run highways down or put it through slum clearance. 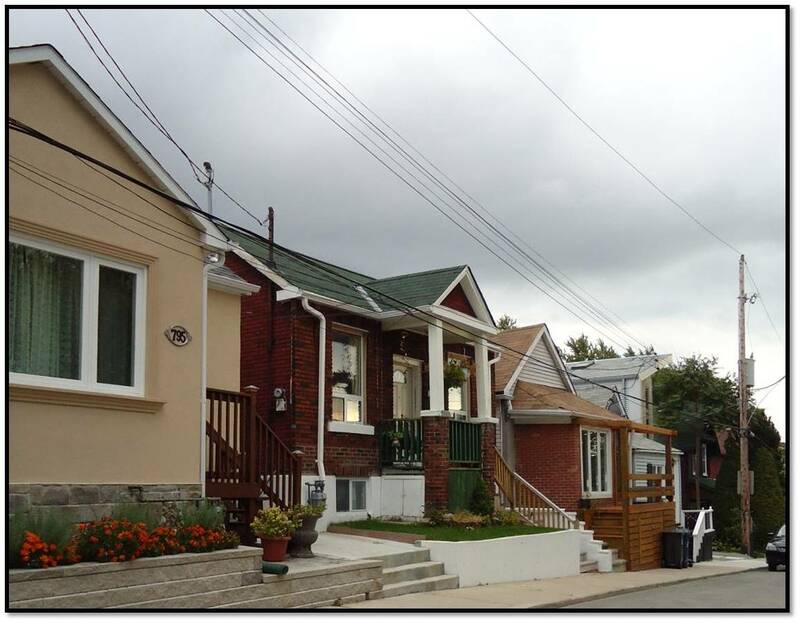 Toronto would not be the same without its street of tiny houses on the east and that long wooden fence on the west. Craven Roaders had a sense of their rights and supported each other. When an Member of Parliament made a casual racist remark, it was challenged. But life on Craven Road in the Dirty Thirties was almost as bad as the winter of 1907 to 1908 when people actually did starve. The East End became associated with hard times, overcrowding and crime, an association that did not lift until the late 1990s.